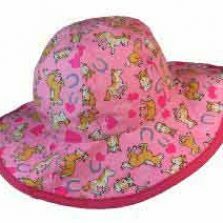 Childrens Sun Hat Range from Umbrella Heaven - 1000+ designs! 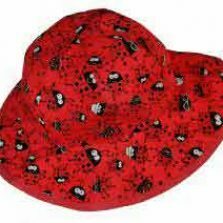 Looking for children’s sun hats? – protect your children from the sun’s harmful UV rays with one of this lightweight, pretty and protective kids sun hats. We take weather protection seriously up here in Umbrella Heaven - both rain and sunshine. Sometimes a childrens sun hat rather than a sun umbrella can be the answer. A sun hat can be more practical when your child just wants to run around and play outdoors on a bright sunny day. A kids sun hat could just be the most important item of clothing you ever buy. Remember the sun doesn't have to feel particularly strong but it can still burn young ones. Keeping your child safe in the sun is one of the most important things a parent must be on top of. Whilst the sun is nice, it can also be harmful. Sometimes sunscreen simply doesn't cut it. A UV protective sun hat is ideal for keeping your child protected in the sizzling sun. Please be sure to protect your child in the sun with either sun cream, a sun hat, a UV protective umbrella... or all 3! Available in different sizes to suit ages from 12 months to 6 years old. We have a number of designs. 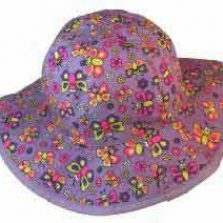 You'll find children's sun hats with ponies, ladybirds or butterflies. Actually, if you really want the set for both sunshine and rain, we also have matching kids umbrellas with pony, ladybird and butterflies - just click here to see our kids clear dome umbrellas. We also have childrens rain ponchos in matching pony, ladybird or butterfly designs - just click here to see our kids rain ponchos. A sun hat can make a wonderful present. Buy a childrens sun hat, wrap it up as a gift and watch them smile - but you'll be smiling too, secretly inside, in the knowledge that you're protecting them from the sun's powerful UV rays. Don't leave them exposed - select from our range of pretty kids sun hats today.